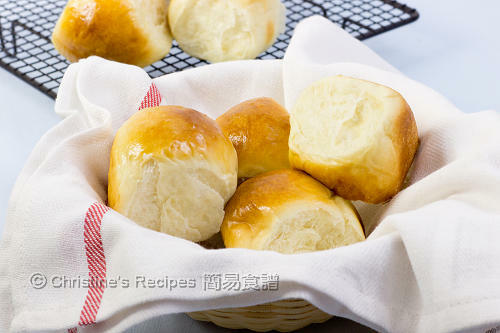 These butter buns are very popular in Hong Kong restaurants and fascinated by those who love soft and fluffy breads. They are perfect for breakfasts, going with eggs and ham, together with a cup of tea or coffee. 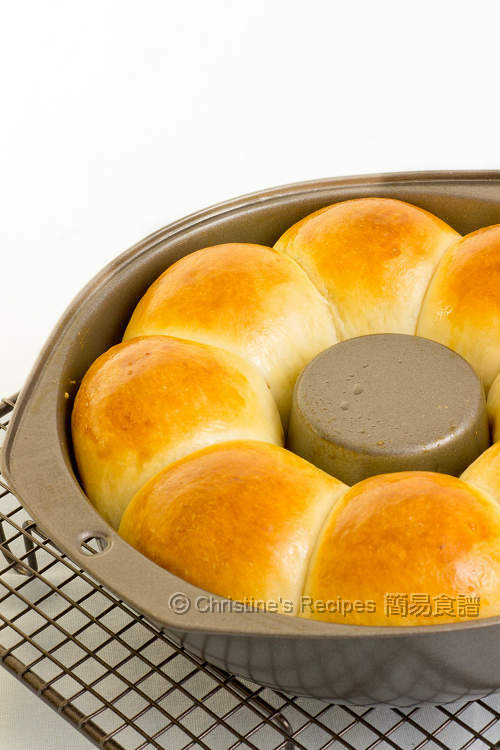 To make these butter buns, it’s pretty straight forward and simple, easier than the Tangzhong bread. Just knead all ingredients into a dough. The trick to get soft and fluffy texture you’re after is that make sure your dough passes the membrane test (aka windowpane test). You can stretch your dough into a thin translucent membrane without breaking it. That means your dough has been kneaded well and enough gluten is developed. Upon the first bite of your lovely soft buns, you’d realize it’s worth every ounce of effort. By spreading more butter on the buns fresh from the oven, if you wish, you’d find yourself more indulged by rich fragrance and buttery flavour. For those who are crazily busy, yet still want fresh buns from your oven early in the morning, a simple tip below the recipe is especially written for you. Mix all ingredients (except butter) in a breadmaker or knead by hand. I used my stand mixer this time. When all the ingredients come together, knead in butter until the dough passes the thin membrane test. (The dough could be stretched to a thin membrane, as shown in the above picture). Roll it into a ball. Place into a lightly greased bowl, cover with plastic wrap. Let it proof untill it's doubled in size, about 1 hour. Transfer to a clean floured surface. Deflate and divide the dough into 8 equal portions. Knead each into a ball shape. Place them evenly in a lightly greased baking tin (shown as above picture). Cover with plastic wrap and let it proof until doubled in size, crowded together, almost reaching the rim, about 1 to 1½ hours. About 5 to 10 minutes towards the end of proofing time, preheat oven to 170C/ 335F. Lightly brush whisked egg on each dough portion. Bake in preheated oven for about 20 to 25 minutes. Remove the buns from the oven and let it stand for 2 to 3 minutes. Turn them out from the tin onto a wire rack. Serve warm with butter if you like. The leftovers can be kept in an air-tight plastic bag or container, at room temperature. The texture of these butter buns is wonderfully soft and fluffy. The leftovers can be kept soft overnight. Just reheat them with your oven and they taste like those fresh from oven. Don’t have time to knead the dough but you still want fresh buns for breakfast? Here’s a workaround. Make the buns the night before, up to the point where they're shaped and put in the tin for the 2nd round of proofing. Wait until the dough has risen halfway, almost touching one another. Yet don’t wait until they are fully risen. Cover with lightly greased plastic wrap, and refrigerate. The next morning, remove the buns from the fridge, and let warm and rise, keeping them covered, for an hour or so. Remove the plastic wrap and bake the buns as instructed in step 3. Can I ask the speed and how long you beat the dough till window pane? Thanks! That is certainly easy! I shall try this method the next time I made some bread.. I have just baked a batching with gelatinized method which is pretty straight forward too! can you tell me what is cake flour vs. bread flour and caster sugar ? I assume milk powder is evaporated milk? Can you list some brands for the flour that I can buy in U.S.? Cake flour is low-protein flour, and bread flour is high-protein flour. Milk powder is milk in powdered form, very different from evaporated milk. Caster sugar is very fine sugar. I'm living in Australia. Sorry, can't recommend any brands in US. Hi you can get cake flour and bread flour from your local grocery store. Try NIndo for milk powder. However most grocery store do sell milk powder by the baking stuff you just need to look for it. Thanks for the recipe! Need to try it soon! Hi you can get bread flour and cake flour from your normal grocery store like Walmart. They do have milk powder Nindo is a brand I would recommend if not they do have milk powder at the grocery store by the baking stuff like the nuts, she'll etc. if you have a super Walmart or super target near u everything is there. Can you tell me what's difference between bread flour and cake flour? What brands can I buy in the U.S.? Also what is castor sugar and milk powder? Is that evaporated milk? Hi Christine, what type of milk powder do you use? I think the most common in stores is skim milk powder but I have seen buttermilk as well. I used full cream milk powder, to enhance the fragrance. If you can't find any milk powder, you can just skip it. Could you advise which brand of cake flour, bread flour and dry yeast you use in australia? I used the DIY 低筋粉 from Asian stores, White Baker's Flour (i.e. bread flour) 5kg, and Defiance's instant dry yeast from Coles. hi christine, is tonzhong method more fluffy and soft or straight method? Or are they similiar in texture? 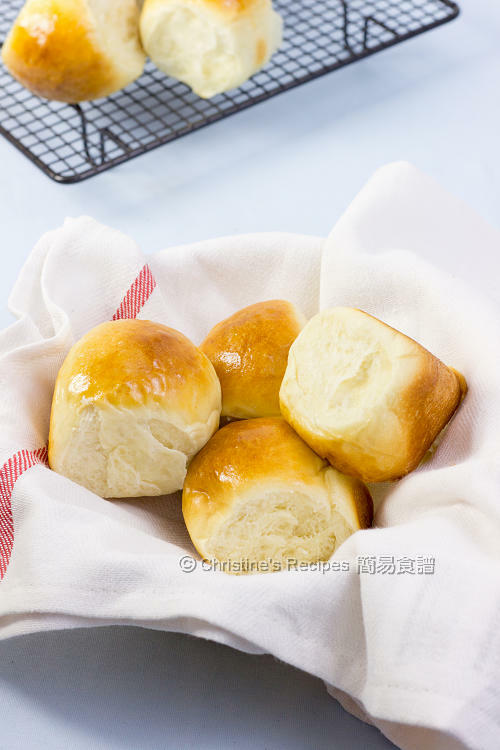 From my experience, both tangzhong and straight methods can make soft breads, but tangzhong breads can be kept soft for more days than those made by straight method. Hi Christine, I am in NZ and I can't find flour labeled as "cake flour" or "bread flour". What we have here are "high grade flour", "plain flour" and "self rising flour". would any of these do? Bread flour is a kind of flour that contains high percentage of protein, around 12.5% to 13.5%. They might be called high protein flour or strong flour in other places. I searched a flour product from NZ, called Champion strong flour, that is very close to my brand that contains 12.5% of protein content. Do you know if your local supermarkets have it in stock? Thanks, I don't see this brand selling in the supermarkets, but the factory is very near my place. Had sent them an enquiry online and hopefully they will reply soon. Also, how about the cake flour? Any substitution? Just try the new brand first, use the strong flour to replace the cake flour to see how it goes. If you like the texture, the it'd be fine. Hi I come from NZ too, would the high grade flour be considered as bread flour? I can imagine how light and fluffy these buns are! Hi Christine, thank you so much for sharing this and many more yummy recipes on your blog. May I ask where did you get your pastry board? I'm looking for something similar with all the dimensions, but the search has been futile! Just bought ur cookbook the "Easy Recipe" from et website. So happy to received it today. I go through the book and there was so many good recipes share inside. But just wonder why all those bread recipe that show in your blog here is not included in the book? Will u come out with book to share all those bread recipe and shaping method? Tried and love the bread! Thanks for sharing such wonderful recipe! Hi Christine, I tried this recipe and the bread is soft. Thanks. I divided the dough into 8 portions but each actual bun is about 3"x3" big, is it correct? Because the buns in your photos are bite-sized.. I put the dough into pre-heated oven to proof so the proofing time was cut down to half. Is this method ok or proof under room temperature better? I ovenbaked the buns on aluminium tray greased with olive oil. However crumb still stick on the tray. No matter how long I soaked, the residue is hard to be removed. Is this normal? So grease-proof paper is more recommendable? Mine were not bite sized though. It should be fine, just divide the dough into 8 equal portions. What temperature did you use to proof your dough in your oven? It shouldn't be too high, you'd "bake" your buns, or kill the yeast. Sure, if your dough is stick to your tray, use baking paper then. It depends on how well your stand mixer performs. I didn't check the time. Just test the dough to see if it's kneaded enough. As for the speed, I started with slow speed, then increased to medium-high. hello christine.....just baked this butter buns & followed everything on your recipe without any alternatives or changes & am so happy it was perfectly good where in fact it was my first time to bake a very simple recipe like this....so soft & fluffy really love it!!!! now, im addicted to follow all your recipes...thank you! So glad you made it and had a big success. Congrats! hihi ! I was wondering if I can substitute bread flour with all purpose flour? Would that change how much flours I need or is it still the same 250gm amount? Yes, you can use all purpose flour instead. As it's a lower protein flour, the texture of end products won't be as fluffier as those made from bread flour, yet they'd still be soft. In USA cake flour is Swan brand. protein 2 gr, regular flour 3gr and bread flour is 4 gr. I follow yr recipe but the bread was not very fluffy. I made the bread at room temperature at about 15 degree and am wondering if this is low for making fluffy bread. If the temperature was only 15C, how long did you proof your dough? Was it doubled in size? I proof the bread for 1.5 hr but it did not double in size. Should I proof it longer until the desired size? Suppose that your dough was kneaded well and your yeast was not expired, your dough wouldn't have proofed enough if it's not doubled in sized. Next time, try to put your dough in an oven or microwave oven with a glass of hot water, it will speed up the proofing process in cold weather. i made bread form your recipe with only bread flour before and it turned out soft and fluffy.this recipe called for adding cake flour.will this make the bread even more soft and fluffy? As bread flour with higher protein content will make bread with a bit chewy in texture, so by adding a bit of cake flour, the bread won't be chewy but softer. Hi christine. I wanted to tell you what a success I have had with your recipe for bread using tang zhong method. We now use this recipe all the time. The bread is wonderfully light and fluffy. Thanks again. Glad that you liked my bread recipes. Happy baking ! Hi, I don't have the bread machine so i always knead by hand but i always knead butter and flour then i will mix in egg and yeast+water+sugar(dissolved together). Is it ok? I've tried to mix in butter at the last step and it always became so oily and sticky. Either knead by hand or bread machine is fine. To get the best result, the butter is the last thing you add after kneading all other ingredients and coming together, because the oil will prevent the flour from generating gluten inside. When you add the butter, it's quite oily at first. Keep kneading, the dough will absorb the butter and you'll get a very beautiful, stretchy dough, not sticky to your hand. If every ingredient, including the yeast, was not expired, and the quantity of all ingredients and method were accurate, it could only be the proofing time was not long enough then. Was the weather too cold on your side? Not really cold. I proofed the dough longer than the time that you suggest but it did not rise. If your dough still could be proofed and doubled in size, only needed longer proofing time than the recipe suggests, it won't be a problem at all. Some people like slower/longer proofing process because the bread will smell better. I made these rolls and they are absolutely wonderful. Can the recipe be doubled, and if so what size pan would be used. Please continue to add bread recipes to your site. They are the best I have ever used. Glad that you like this bread recipe. If you want to make double quantity, you might like to use two pans because it's much easier to control the results. Thank you for the prompt reply. I live in USA in Georgia and I really like your bread recipes. They are awesome and turn out perfect every time. Also could this dough be made in loaf form? You can bake the bread in loaf tin for sure. Simply adjust the baking time. I am trying this recipe tonight, can I ask which level or height of the tray do you bake the buns in? I just put them in the middle level. Is this correct? Simply place your baking tray in the middle rack of your oven. They will be heated evenly. So glad that you and your family love my bread recipes. You got a Kitchenaid, such a bliss! You don't need to get the water and milk at the exact temperature. Just feel it's lukewarm, and not over 40C. Otherwise the yeast will be killed if they contact the hot water. It's better not to use milk straight from the fridge, at least leave it at room temperature for 20 minutes or warm it up. Can I substiture cake flour to betty crocker cake mix? Thanks! We don't have the cake mix you mentioned in my local supermarkets. So, don't know what ingredients are inside the product. Please check the ingredient labels on the packaging. This recipe only yields for pure cake flour, that's low protein flour. 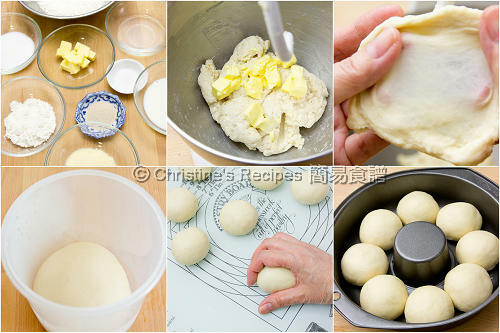 Hi Christine, when I kneaded the dough in to the ball shape, the dough was really sticky. They dis not look like the balls in your pics. Did I knead them not long enough? If the dough is kneaded enough and generate enough gluten inside after proper proofing process, the dough is not too sticky to handle, see the picture at the right. Did your dough pass the windowpane test (see method 1)? as u said dunno how long it takes for the kneading (mixer) until getting the membrane effect but it shud be ok to knead longer until we really get the smooth ball of dough which not sticking to hand? If the dough still sticking to our hand meaning is not ready yet right? Every mixer performs very differently. My stand mixer kneads over 30 minutes. But my breadmaker only kneads 25 minutes. Simply test the dough if it's not sticky to your hand and pass the window-pane test, it's done. Wonderful. Glad that you liked these buns. I won't recommend to freeze this dough as it's quite risky and hard to control the texture of end product. Could it be that your dough was over-proofed? Normally, the dough won't be deflated when egg washing. Is it a must to let the dough proof 2 times ? Can I just shape the dough into the smaller size and straight away proofing then bake ? It's not a must. I just feel it's better to have 2 rounds of proofing. You can try your idea if you like. I had tried out the recipe once. All ingredients, measurement and methods were the same except I used only 70 or 80ml water. I let it proof twice, the second proofing seems not as big as the first time. Well, the bun turn out with very good smell, but it was not fluffy and a bit crusty and was quite heavy. Not sure where goes wrong. Could you please advise me?? Highly probable that not enough gluten was generated even though your dough was kneaded for 30 minutes with your KA. For kneading sweet soft dough, I found a bread machine performs better than a stand mixer. You reckon my hand power could do better job than a mixer? Hi Christine, in this recipe ther is only one time for prooffing? There are 2 rounds of proofing mentioned in "Method" step 1 and 2. Hi Christine, could you care to elaborate on step 2? The part where we are ask to knead it into 8 balls. Is it a lot of kneading and when do you stop? I am a novice at bread making. In fact this is my first attempt. Kindly help. As for step 2, it actually doesn't need to knead the dough like you do in step 1. You simply "roll" the 8 equal portions with your palms into ball shapes shown in the middle-bottom picture. Think that "tang min fun" you said is 澄麵粉. You can't replace cake flour with it. They are very different. If the weather is quite hot, you don't need to warm your milk, just rest it at room temperature for a while then.